I’m qualified to play in the next RPTQ for Pro Tour Aether Revolt in Dublin, and I’ve been wracking my brain trying to figure out how to win it all. I know this is going to sound like a cop-out, but I’m really not interested in buying the Dredge or Infect deck, even if one of them is the best deck in the format. I know the end result of an RPTQ can quickly repair any regret I may have from purchasing the cards, but I think I can leverage my experience playing and sideboarding with Burn to a better finish. Come join me today on my journey to figure out a way to incinerate Prized Amalgam and Blossoming Defense. If you’re not familiar with Burn from the pilot’s side of things, you might think it’s a cut-and-dry deck that always runs the same cards. In reality there are tons of decisions that will affect your positioning in a given metagame, as with any major Modern archetype. Today I’ll walk you through my build from the ground up, starting with the expected metagame that will inform our choices and fleshing out the list from there. To finish I’ll present the final decklist. The number of creatures, spells, and lands in Burn has fluctuated from person to person but some things always remain the same. If we want to survive and adapt in the Dredge metagame we need to be as fast as them but also interact with their plan. Right now I think we need to go with the lean, mean creature package. No Wild Nacatls and no Grim Lavamancers. Wild Nacatl is in a weird space where it’s not big enough to survive Lightning Bolt and strains our mana more than necessary. Grim Lavamancer is just really slow and there isn’t a ton of value in killing the small creatures in Dredge. I also want every creature to be able to impact my opponent’s life total the turn I play it. A side effect of Infect becoming popular is the need for decks to interact with one-mana creatures more reliably. Many decks were already playing Lightning Bolt, but the prevalence of Collective Brutality (especially out of Dredge itself) means we really want to get in for at least a few points before our guys inevitably die. With that said, I’m just playing Goblin Guide, Monastery Swiftspear, and Eidolon of the Great Revel for now. If you’ve read my previous articles, you know I was trying out Bedlam Reveler. While I think Bedlam Reveler is still good, it just isn’t well positioned right now. It’s too slow against the decks people are playing the most. 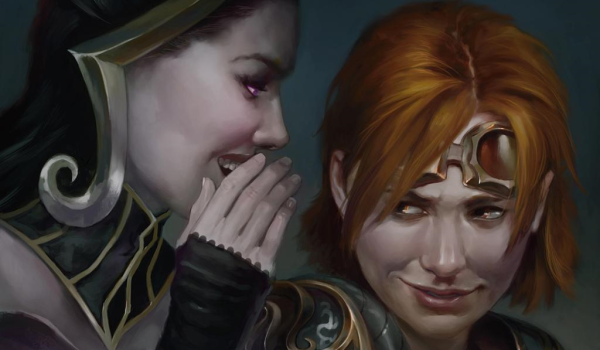 If Jeskai Nahiri, Jund, or Abzan are more popular in your area, then Revelers might be a good call. There’s a certain line-up of burn spells you need to include to make the deck competitive. These cards may have varied somewhat over the years, but for the most part they’re just standard in all lists. When you start writing a decklist for Burn you start with 4 Lightning Bolt, 4 Lava Spike, 4 Boros Charm, and usually 4 Rift Bolt. After those 16 cards it gets a little more fuzzy. My plan is to be able to race Dredge; in order to do that we need to cut a color from the deck. I don’t think we need the 2 extra damage that Destructive Revelry would provide, or the possible 1-2 more damage during an attack step from Atarka’s Command. My plan is to play a game of inches, and conserving a few extra points of life when possible is a big deal. So if we’re not including green cards, what are we playing instead? Some people might disagree, but I can’t convince myself to play less than 4 Searing Blaze. When it’s good, it’s overpoweringly good. When it’s bad, it’s unplayable. Usually when it’s bad, it’s because you’re playing against a slower deck without a lot of creatures. In those games Burn is so quick that drawing a blank Searing Blaze isn’t enough to cost us a game. After 4 Searing Blazes, we have space for nine more spells and 19 lands, or eight more spells and 20 lands. I’ve decided after careful consideration to go with nine spells, 19 lands. I’m playing 3 Skullcrack. The fourth copy is in my sideboard because life gain isn’t terribly common these days, but they’re still a necessary evil. The next two slots are for Lightning Helix. It’s ends up working a lot like a reverse Searing Blaze in a lot of matchups. For the final four spell slots, I don’t want anything that costs more than one mana. After a lot of thinking, I’ve decided to continue using the 4 Gitaxian Probe I was playing before alongside Bedlam Reveler. Much of the spell’s value ended up being knowing what to play around. I’m pretty confident playing against stock lists, but every once in a while you play against some weird cards you haven’t seen in a while and it causes problems. Probe also makes the deck a virtual 56 cards, meaning there’s a higher density of one-mana threats. When you get the draws that allow for a free prowess trigger on Monastery Swiftspear, you feel like the king of the world, trust me. I know it looks odd in a deck that’s also playing Eidolon of the Great Revel, but I’ve had excellent experiences with Probe. It plays a lot better than it looks on paper. Not many changes here, but we do get the ability to play the new Boros-colored fastland, Inspiring Vantage. Unfortunately this land doesn’t really work out too well when you play too many of them. While it’s unlikely that we ever want four lands in play as Burn, it happens sometimes, and Inspiring Vantage is light-years worse than Sacred Foundry in those scenarios. That being said, I still managed to find room for two of them because the games you start at 20 are a lot easier to win than the games you start at 17. The only other thing to mention is that I’m a big fan of 4 Basic Mountains in the deck. Some Burn decks play 2-3 but you aren’t able to take advantage of the extra mana Path to Exile decks give you if you don’t have enough to find. With the additional white sources from Inspiring Vantage, I cut Sacred Foundry down to three copies and filled out the rest with red fetchlands. If you can afford it, I recommend playing a variety of different fetches rather than four of a few. It’s a small issue, but occasionally having too many of the same-named card (against Surgical Extraction or Pithing Needle, for example) is a disadvantage. Surgical Extraction: I don’t think enough people are playing this card. The fact that you don’t actually have to pay any mana for the spell is really the biggest upside and is seriously underrated. Extraction is highly specific in what it targets—some may even say surgical—helping us deal with the biggest problem card in the Dredge matchup: Prized Amalgam. The way that the most recent Dredge decks are built, it’s not terribly difficult to beat a pile of Bloodghasts and Narcomoebas. The deck’s true power draws involve multiple Prized Amalgams returning to play quickly. Surgical Extraction lets you interact with those types of draws without causing a strain on your mana. The biggest problem I’ve had with Rest in Peace and Grafdigger’s Cage as sideboard cards is that you have to take time off from playing spells that kill your opponent to cast them. The other problem is sometimes they’re just too slow. If you’re on the draw and your opponent plays a Cathartic Reunion and dredges 3 Golgari Grave-Troll, you might already be too far behind. Kor Firewalker: This one is pretty obvious. It gives you an edge in the mirror. If you know a lot of your local players play Burn, then you will want some of these in your sideboard. Ensnaring Bridge: I didn’t originally intend to include Ensnaring Bridge, but the more I see it in sideboards, the more I feel I need to try it. Turns out it’s pretty good. It’s great against decks with larger creatures, which can normally turn the corner and close out quickly. It’s great against Bant Eldrazi (which can otherwise be a pretty tough matchup) as well as weird off-the-wall decks and tribal decks. I’ve boarded it in against Merfolk and watched as they wished they could remove their Lord of Atlantis from play to get in a meager attack. Deflecting Palm: If you’ve never Deflecting Palmed an opponent who was sure you were dead and lethaled them in response, you haven’t lived. The first copy is great. The second copy a lot less so. Players rarely play around it and when walking face first into it, often die. I can’t recommend more than one but I also can’t recommend less than one. Path to Exile: These are extremely flexible and I can’t find a reason I’d ever remove all of them from my sideboard. I recommend 3 or 4 because they’re just so great in so many places. Most of the time they’re used to remove large blockers (i.e. Tarmogoyf) but they also give you more one-mana interaction against creature-based combo decks like Infect. Wear // Tear: Another flexible answer that replaces Destructive Revelry. If you know your opponents are playing a lot of Leyline of Sanctity, you can increase the number that you play. They’re also pretty reasonable against Lantern Control, Affinity, and Tron. Kataki, War’s Wage: This is only a good sideboard card against Affinity. If your local meta has Ad Nauseam decks too I would recommend Stony Silence instead. Bedlam Reveler: Reveler can be a great sideboard card if, like I mentioned earlier, your metagame is much slower with a lot of grindy BGx or UW decks. Flames of the Bloodhand: Sometimes you just really need to beat Bogles. This lets you beat Bogles. I’m not really a big fan of this card but it’s a necessary evil sometimes. Smash to Smithereens: You can replace some of your Wear // Tear with Smash to put more pressure on the Affinity matchup, but it doesn’t solve the problem of losing to a well-timed Spell Pierce. Right now I’m tuned to beat Infect and Dredge, with some hedges against Bant Eldrazi. I might increase my Affinity hate in the coming days as I also expect that to be pretty popular at my RPTQ. If the RPTQ were tomorrow, this is the deck I’d probably end up playing. Seems like a good reason to not run Gitaxian Probe. I also think your reasoning for running a variety of fetches in faulty since nobody will ever have Pithing Needle or Surgical Extraction against you. You stand to gain more from playing lands that might make opponents think you’re on a different deck in Game 1s where you just play a fetch and pass (Tarn and Mesa are probably the best options; it helps too that they’re more expensive than the KTK fetches, since budget players breaking into Modern with Burn are less likely to get Tarn/Mesa if they just need any 10 red fetches). So I know I said that the reason I don’t want to play green contradicts playing probes but the reality is you can sideboard out all of your probes pretty easily where you life matters a lot. You can’t sideboard out all of your green cards when they don’t matter. The worst decks to draw probes against are the mirror, affinity, and zoo. Almost every other deck the 2 life is worth a peek at their hand to figure out a game plan. If you’re playing a turn 1 fetch and not activating it you probably kept a bad hand. Burn is trying to leverage it’s speed and efficiency and if you’re not casting a spell on the first turn you’re way behind. If you want to favor Red fetches, Wooded Foothills is the worst and Scalding Tarn is probably the best in this regard but one deck in particular plays maindeck extractions and needles. If you’re playing against lantern control you don’t want to lose game 1 because games 2 and 3 get so much harder when they remove all of their bad cards. Nice article, well writen walk through of assembling a deck that as you say on the surface looks as straightforward as they come. Decision to cut green in particular is well reasoned and looks good – more skeptical of the probes after talking about how losing life to fetch shock is bad in a game of inches, but if they work they work. I wasn’t particularly good at explaining the difference so I can see why people are scratching their head. In the matchups where you need to go faster and conserve life, you can sideboard out your probes. You can’t sideboard out all of your green cards in those matchups. Given there are really only a handful of decks I think they’re actively bad against, unless you know your local meta is excessively aggressive I think keeping them in the maindeck helps the most. If you take them out, you probably need to add an extra land, Shard Volley, and Grim Lavamancer. I have been a long time follower, but this is my first ever post. Since reading the last article about the Bedlam Reveler burn I removed green from my deck and I haven’t had a single regret about it. I was wondering how you feel about the red miracle Thunderous Wrath? I have been playing around with 1 or 2 copies in my main deck and haven’t been disappointed with it even tough they don’t work well with Gitaxian Probe.. Thanks for the awesome blog and keep ’em burning! I’m not sure Burn can afford to have a card in it’s opening hand that it probably can never cast. It also puts you into an awkward spot where you might draw it and may not want to cast it.